Info "Snap the Joy-Con into the correct side of the system. It's so satisfying to hear it click into place... The Nintendo Switch was released in 2017." 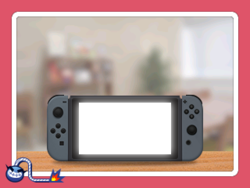 Joy-Con Slide is one of 9-Volt's microgames in WarioWare Gold. The player must slide in the Joy-Con on a Nintendo Switch console. 1st level difficulty: One Joy-Con is partially slid into the console. 2nd level difficulty: Both Joy-Con are outside the console, and may occasionally be on opposite sides. 3rd level difficulty: The player must select the correct Joy-Con to slide into the console. This page was last edited on March 10, 2019, at 00:40.